Last week when I wrote about Graeter’s Ice Cream I mentioned that I have been eating lots of small brand and locally produced ice creams. 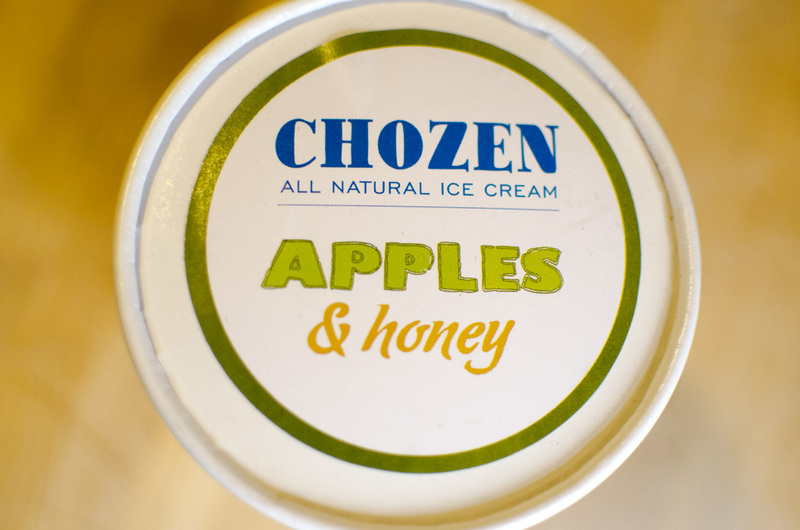 One of those brands is Chozen, an ice cream company that makes ice creams with Jewish-themed flavors (Kosher, of course). Flavors like Ronne’s Rugelach (cinnamon ice cream with rugelach chunks), or Coconut Macaroon. My favorite flavor is Apples & Honey. If you’re not Jewish you may not have had this flavor combination before, but it is a traditional Rosh Hashanah snack. Something about making sure the coming new year will be sweet, I think. Also, if you haven’t had this combo before you should definitely try it; there’s something about the smoky sweetness of the honey and the way it contrasts with the crisp, acidic sweetness of the apple that’s just magical. So Chozen’s version of honey ice cream (!) with pieces of apple in it. Their website is currently under construction and it looks like they may be unveiling new flavors. I can’t wait to see what they come up with.